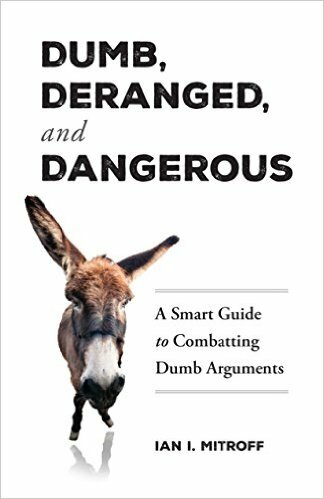 From the dumb and silly to the outright paranoid and pathological, Dumb, Deranged, and Dangerous is a hard-hitting analysis of the wide variety of dumb and illogical arguments that are awash in America today. Dumb and illogical arguments are not only a measure of the low level to which public discourse has sunk, but they displace serious communication and analysis, thereby keeping us from addressing society’s most important problems. Dumb, Deranged, and Dangerous is about how to recognize, analyze, and counter an especially pernicious class of arguments that by their very nature do extreme cultural damage. This book shows how to push back against some of the most toxic aspects of American culture that prevent us as a nation from thinking clearly on the important issues of the day. While not perfect or overwhelming, the people decided in the midterms to check on the President’s power. Expect more to come. It’s our only hope. If there were any doubts whatsoever about President Trump’s mental state, they were completely dispelled by his performance on the day after the elections. Because of the grave danger he poses not only to our country but to the world, in The Dangerous Case of Donald Trump: 27 Psychiatrists and Mental Health Experts Assess a President, all of the contributors felt strongly that it was their moral duty to break with the long-standing, self-imposed rule of not diagnosing someone that they had not examined personally. The feeling was that on a daily basis Trump exhibited more than enough instances of disturbing behavior to reach definitive conclusions as to his mental health. The overwhelming judgment is that he suffers from literally every known form of mental illness: pathological narcissism, delusions, paranoia, frequent breaks with reality, etc. What they came tantalizing close to saying it but did not is that Donald Trump fits all of the traits associated with psychopaths. Does this thereby make him one? In my judgment, the answer is unequivocally “Yes!” Indeed, not only does he not hide his disturbing behavior for all to see, but he flaunts it daily. Once again, it was on full display on Wednesday. While all of the traits associated with psychopaths are highly unsettling, the callous lack of compassion and empathy for others stands out. Indeed, it’s one of the primary characteristics. The latest is his total lack of compassion for those who suffered in the California wild fires. No wonder why he constantly hurls insults and mocks others. And, why you’re either with him or not; no grey area is tolerated. It helps as well to explain his pronounced inability to accept any responsibility for his words and actions and the need to constantly blame others. It also accounts for his lack of remorse or any sense of guilt. And, it explains his propensity for violence. The constant need for stimulation in the form of adoring rallies, highly impulsive behavior, and a highly inflated sense of self-worth are also major characteristics. Promiscuity is a major trait as well. And last but not least is lying pathologically. What is most disturbing is how those who voted for Trump and continue to support him no matter what not only rationalize his behavior, but revel in it. While they may not be psychopaths themselves, they are enablers of it nonetheless. One cannot reason with psychopaths because reason is not part of their makeup. Nor is it part of those to whom they appeal. The only remedy left is political. While not perfect or overwhelming, the people decided in the midterms to check on the President’s power. Expect more to come. It’s our only hope.